Go Daddy has managed to effectively gag its fiercest critics by acquiring and then shutting down the high-ranking Go Daddy gripe site: NoDaddy.com. For over four years, No Daddy hosted a forum detailing a range of "horror stories" submitted by Go Daddy customers and disgruntled current and former employees. Insecure.com opened the site in 2007 to protest Go Daddy's unilateral decision to seize the domain name SecLists.org, after MySpace complained that thousands of hacked user passwords had been posted to a security mailing list archived there. "What started to document the improper suspension of SecLists.Org grew to cover dozens of other GoDaddy scandals including shill bidding on their own domain auctions, improperly blocking users from transferring domains to other registrars, sexual harassment, constant objectification of women, killing elephants for promotional purposes, etc. We're hopeful that GoDaddy's new owners will stop these shenanigans." They did not disclose that the shut-down would also see the site's web address transferred to Go Daddy. 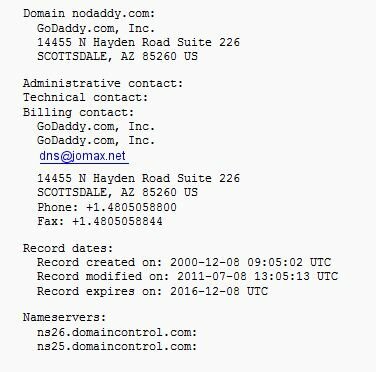 Over the weekend, the Whois record for the domain name nodaddy.com started briefly displaying Go Daddy's contact information (see screen grab above) before switching to Domains By Proxy, a privacy service owned by Go Daddy. "Sometime in July we reached an agreement between Insecure.Com LLC and GoDaddy.com to transfer the domain name NoDaddy.com," a Go Daddy spokesperson confirmed. The shut-down announcement coincided with Go Daddy's agreement to a landmark investment deal valued at a reported $2.25bn, with KKR, Silver Lake and Technology Crossover Ventures. The deal saw Go Daddy founder Bob Parsons reduce his stake in the company to below 50 per cent for the first time, though he remains the largest shareholder. He also became executive chairman, handing the CEO mantle to COO Warren Adelman. Go Daddy did not confirm or deny that the NoDaddy deal came at the behest of its new owners. The site's former owner did not respond to a request for comment. NoDaddy, until its closure last week, appeared in the top five results on Google whenever anyone searched for the term "Go Daddy". The site's forum was in recent months dominated by hundreds of vitriolic posts from one Toby Harris, who briefly worked in the company's Arizona call centre and is now suing the company for what he calls "wage theft" over allegedly mishandled overtime payments.